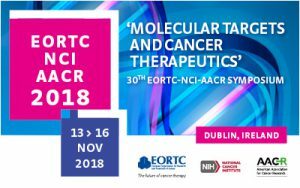 MErCuRIC Coordinator Prof Sandra Van Schaeybroeck (QUB) and PI Prof Richard Wilson (BHSCT) presented recent project findings at the EORTC NCI AACR symposium in Dublin. This year’s meeting theme was “Molecular Targets and Cancer Therapeutics”. The research poster entitled “MErCuRIC1: A phase 1 Multi-Centre Study of Crizotinib (cMET inhibitor) Combined with Binimetinib (MEK1/2 inhibitor) in Patients with Advanced Solid Tumours” was presented on Friday, November 16, 2018. Herein, the first results from the MErCuRIC dose escalation and dose expansion study of the combination of MEK and MET in RASmt colorectal cancer patients were presented. The poster (link below) also showed the first data on MET as potential biomarker using samples of the MErCuRIC clinical trial. Poster discussion with meeting attendees focussed on the importance to explore further mechanisms of response/resistance to this MEK + MET combination, using available clinical samples and pre-clinical translational studies. Sandra Van Schaeybroeck commented: “I believe that we can learn a lot from the MErCuRIC clinical study. We want to nail down the role of MET, at gene, mRNA and protein level as a prognostic and predictive biomarker in early stage and metastatic CRC. We want to underpin mechanisms of intrinsic CRC tumour resistance to MEK and MET inhibition, that will inform future studies with MEK and/or MET inhibition, not only in CRC but also other tumour types”. MErCuRIC is funded by the European Community’s Framework Programme Seven (FP7) under contract #602901.